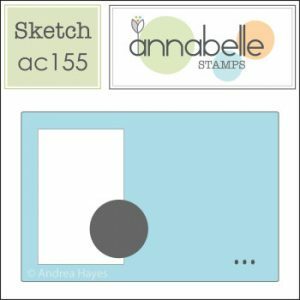 Hello and welcome back to another AnnaBelle Stamps challenge. This week we have a sketch for you. 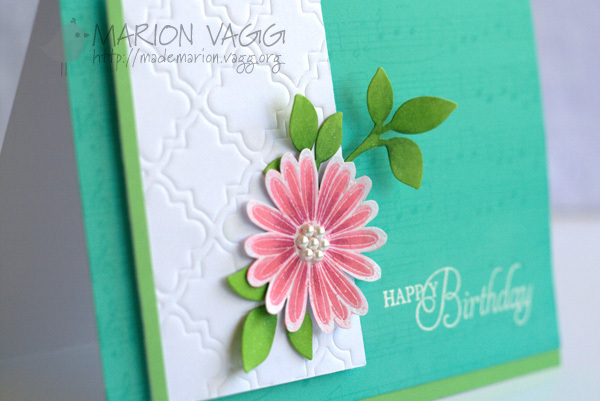 I had fun creating this card…it took a little while for it to come together, but that is normal for me. I was happy with the results though. 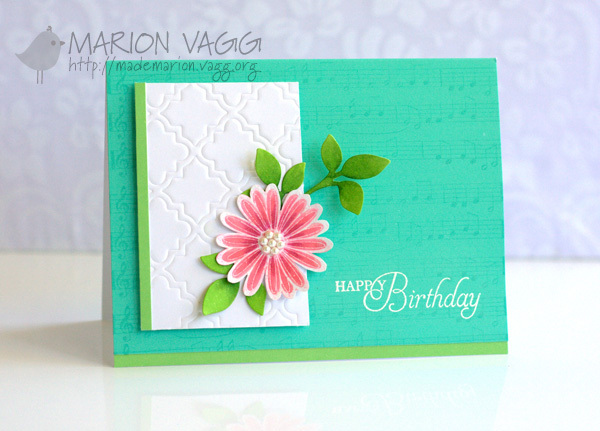 The flower is from the Daisy Delight stamp set, the musical background is from the BBD#6 stamp set and the sentiment is from the newly released Designer Flowers stamp set. I love all the sentiments in this set. 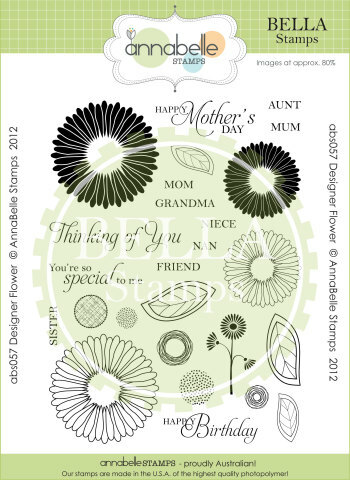 Stamps: AnnaBelle Stamps Daisy Delight stamp set, AnnaBelle Stamos BBD#6 stamp set, AnnaBelle Stamps Designer Flowers stamp set. This week’s winner will receive a $15 Gift Voucher to the AnnaBelle Store. Hope you will play along with us. Be sure to check out the rest of the Belles’ projects – their links are on my side bar. 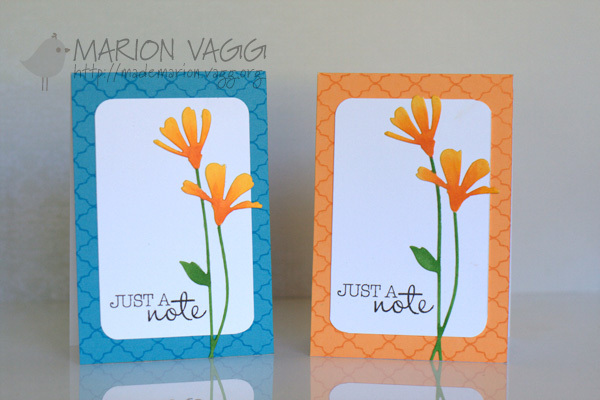 Make sure you also stop by Janet O’Brien’s blog – she is Guest Designing with us. 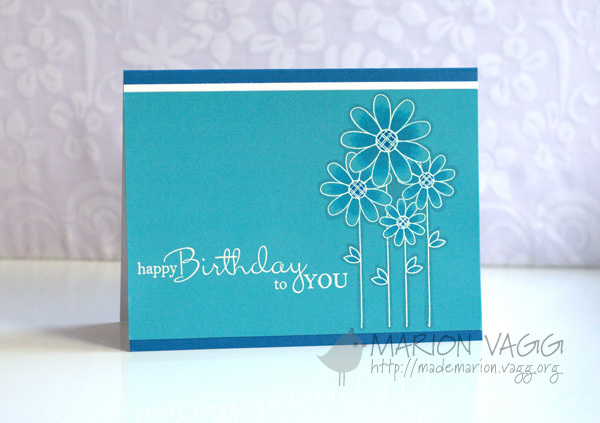 This card was a really quick (and small) birthday card I made for a friend’s son who had a birthday last week. I already had the rocket coloured in, so it took less than 5 mins to assemble, which is unheard of for this slow crafter. 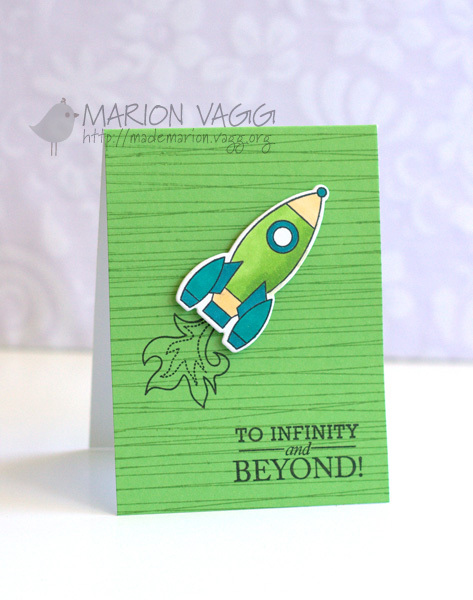 The rocket stamp/die is from Papertrey Ink and I just can’t get enough of my AnnaBelle Stamps background stamp – BBD#5. Here is the other set of cards that I made as Christmas gifts. I made two sets of these. They are very similar to the first set that I blogged here. 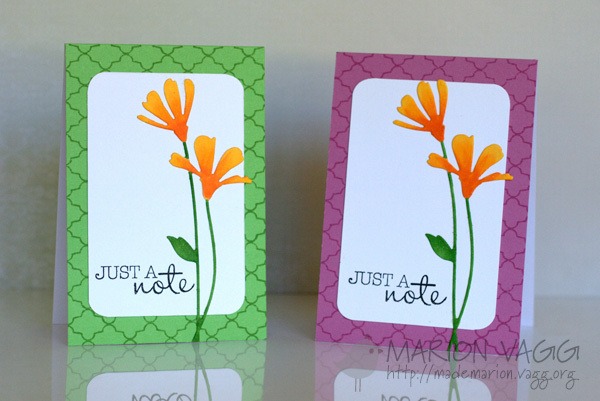 As you know, I love making colourful sets of cards – I’m addicted. 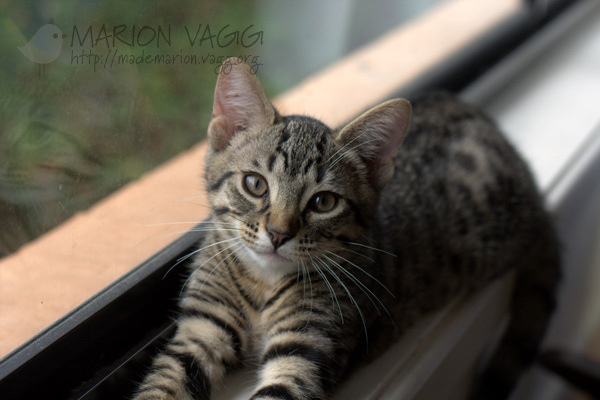 Just before I go, I want to show you the latest addition to our family. His name is Mack. He is adorable and is being drowned showered with love by my two kids. It is their first pet, so they are very excited! Today, two new stamp sets are being released along with some new gingham ribbons! 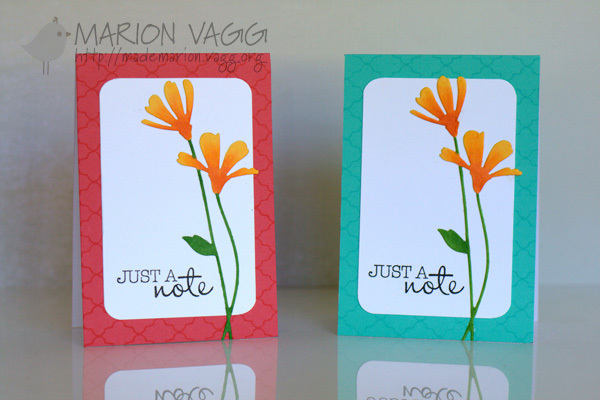 First up the new stamp sets – Designer Flower and Standing Tall. I had so much fun playing with these new sets, I made four cards. The first two are almost identical, I just used different mediums. Prisma colour pencils on the first one and Distress Stains on the second. And for the next two, I white heat embossed again, and added subtle shading with Copic Markers. I used a teeny tiny little bit of the new Licorice gingham ribbon on the last card. 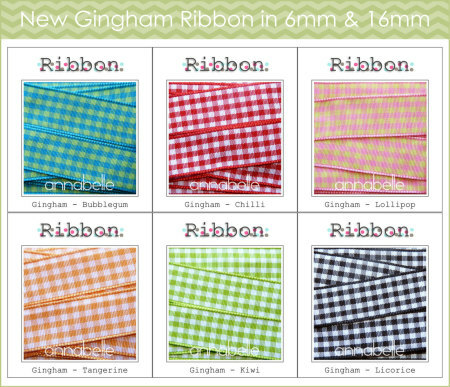 Here are all the new gingham ribbons coming into the store. Now for a GIVEAWAY. First prize is both the new sets and the second prize is some Gingham Ribbon – 2m of each colour. In order to be in the running to win the blog hop prize, you need to comment on all of the DT’s blog and then head back to the ABS blog and add your name to the inlinkz. You have until Sunday 8pm (Australian EST) to enter. Combo Special Deal – Standing Tall and Designer Flowers will be discounted by 20% for this weekend only! 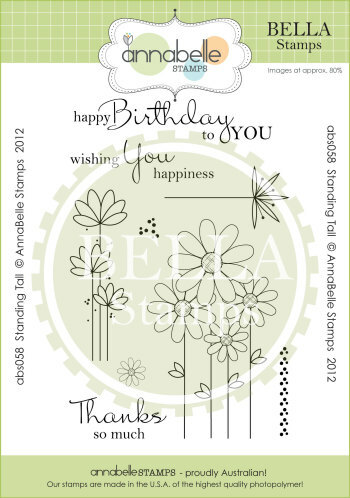 If you happen to be the lucky winner of the blog hop and have ordered them, you will be refunded. Your next stop on the hop is Therese. No doubt she will have some eye candy for you. 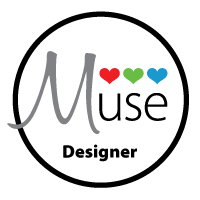 Just popping in quickly with a little announcement about a new challenge blog that is launching today called Muse Card Club. This is a new venture created by the very talented Jackie Rockwell. What’s more, I have been asked to join the Design Team! Wow…I am very privileged to be working alongside some of my biggest crafting idols! Head to the blog here for more details on what the challenge blog is all about and to see who else is on the Design Team. Hope you will join us for the fun ride. Go here now…what are you waiting for!